Mountain Home AFB is located in Elmore County, Idaho, approximately 12 miles southwest of Mountain Home. The host unit is the 366th Fighter Wing. 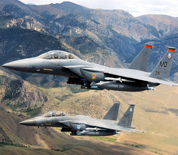 The mission on base is to maintain combat airpower and support capabilities. Additional units include the 726th Air Control Squadron and the 266th Range Squadron of the Air National Guard. This Mountain Home AFB directory features the critical info you’ll need to navigate through the facilities and recreational opportunities available on base.